When you are shopping for dog food, always consider the age & breed of your dog. Shopping decisions are different if your dog is a puppy, adult, or senior. In most cases, puppies require a high-calorie intake for their energy while senior dogs need food that will help sustain their joints. When considering their breed, most food that is made specifically for the size of a dog’s mouth and the energy requirements of each breed. Always be aware of your dog’s current health. Being aware of your dog’s specific health problems can also play a role in choosing the best dog food. If your dog has issues with dental hygiene, weight, and food allergies, a special diet should be taken into consideration. Last but not least, make sure you read the labels on your dog’s food. Labels will list ingredients based on the amount that is in the food. 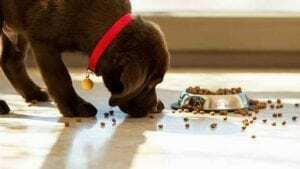 Dogs are omnivores, and they need a diet packed with protein. Most veterinarians will recommend something with meat or meat meal located in the ingredients; however, there is a growing contingent of vegan vets who support plant-based proteins for dogs. The canine body can transform certain amino acids, the building blocks or protein, into others, meaning that dogs can get all the amino acids they need while avoiding meat. But, you should also avoid dog food that has the first ingredient listed as a grain. The high grain content of many pet foods is a primary contributor to the growing obesity and allergy problems in pets. Ultimately, higher quality ingredients will cause you to pay a higher price for the benefit. In the long run, your dog will get all of the nutrients they need to live a long and healthy lifestyle.